Avoidance of noxious stimuli is essential for the survival of an animal in its natural habitat. Some avoidance responses require polymodal sensory neurons, which sense a range of diverse stimuli, whereas other stimuli require a unimodal sensory neuron, which senses a single stimulus. Polymodality might have evolved to help animals quickly detect and respond to diverse noxious stimuli. Nematodes inhabit diverse habitats and most nematode nervous systems are composed of a small number of neurons, despite a wide assortment in nematode sizes. Given this observation, we speculated that cellular contribution to stereotyped avoidance behaviors would also be conserved between nematode species. The ASH neuron mediates avoidance of three classes of noxious stimuli in Caenorhabditis elegans. Two species of parasitic nematodes also utilize the ASH neuron to avoid certain stimuli. We wanted to extend our knowledge of avoidance behaviors by comparing multiple stimuli in a set of free-living nematode species. We used comparative behavioral analysis and laser microsurgery to examine three avoidance behaviors in six diverse species of free-living nematodes. We found that all species tested exhibit avoidance of chemo-, mechano- and osmosensory stimuli. In C. elegans, the bilaterally symmetric polymodal ASH neurons detect all three classes of repellant. We identified the putative ASH neurons in different nematode species by their anatomical positions and showed that in all six species ablation of the ASH neurons resulted in an inability to avoid noxious stimuli. However, in the nematode Pristionchus pacificus, the ADL neuron in addition to the ASH neuron contributed to osmosensation. In the species Caenorhabditis sp. 3, only the ASH neuron was required to mediate nose touch avoidance instead of three neurons in C. elegans. These data suggest that different species can increase or decrease the contribution of additional, non-ASH sensory neurons mediating osmosensation and mechanosensation. The overall conservation of ASH mediated polymodal nociception suggests that it is an ancestral evolutionarily stable feature of sensation. However, the finding that contribution from non-ASH sensory neurons mediates polymodal nociception in some nematode species suggests that even in conserved sensory behaviors, the cellular response network is dynamic over evolutionary time, perhaps shaped by adaptation of each species to its environment. Despite a more than 1000-fold range in the sizes of different nematode species, nematode nervous systems are composed of a small number of neurons: Caenorhabditis elegans, which is 1 mm long, has 302 neurons , whereas the parasite Ascaris lumbricoides, which grows to be 20 cm long, has 298 neurons . This constancy in number of neurons suggests a constraint in the nervous system of nematodes. Free-living nematodes use amphids and phasmids as sensory structures to seek food and avoid harmful stimuli [3, 4]. In C. elegans, the functions of several of the amphidial neurons and their roles in various behaviors have been characterized in detail [3–5]. Parasitic nematodes, on the other hand, use amphids to either actively seek the host (Strongyloides stercoralis) [6, 7] or passively seek the host (Haemonchus contortus) [8, 9]. Electron microscopic reconstruction of the amphids of the free-living nematode C. elegans and several parasitic nematodes such as H. contortus and Ancylostoma caninum, have shown that the sensory neuroanatomy is remarkably similar between the different species [1, 6, 7, 10, 11]. For instance, the amphid sensilla in H. contortus, a passively ingested parasite of sheep, shows the presence of 12 sensory neurons just like in C. elegans [1, 8, 9, 11]. This conservation of neuroanatomy between H. contortus and C. elegans is in perfect correlation with the current phylogeny wherein this parasitic nematode is in the same order as C. elegans [12, 13]. However, it is surprising that even in the distantly related nematode parasite S. stercoralis, there is remarkable similarity of the amphid structure with C. elegans [6, 7, 10]. Given this similarity, it is highly likely that similar cells would mediate the same behaviors across these diverse nematode species. Studies by Schad and colleagues on the role of homologous neurons mediating chemotaxis, thermotaxis and development in parasitic nematodes have shown that positionally homologous neurons perform similar functions in these species, suggesting that neuronal function is conserved between free-living and parasitic nematodes [10, 14, 15]. Infective juveniles in parasitic nematodes use chemical, physical and thermal signals to find their host and resume development [14, 16, 17]. For instance, the finger cell AFD neurons in H. contortus and the dog hookworm A. caninum act as thermosensors just as in C. elegans [17, 18]. Even in a more distantly related nematode S. stercoralis, ablation of the ASE neuron and ASH neuron resulted in loss of attraction to sodium chloride at lower concentrations and avoidance of high salt concentration respectively [19, 20]. These results suggest that C. elegans can serve as a useful model in understanding the role of different sensory neurons in diverse nematode species. Involvement of other amphidial neurons such as the ADL neuron in chemorepulsion to SDS in A. caninum suggested that the sensory repertoire could change in nematodes . We have now extended the work of Schad and colleagues by comparing multiple avoidance behaviors in diverse free-living nematode species to further investigate sensory response evolution. In particular, we studied avoidance responses to aversive stimuli mediated by the polymodal neuron ASH. In C. elegans, the bilaterally symmetric pair of 'polymodal nociceptive' ASH neurons mediates stereotyped avoidance to high osmotic strength, certain odorants, nose touch, acidic pH, heavy metals, and alkaloids [5, 22–25]. Avoidance of these stimuli involves a highly stereotyped withdrawal response that is well characterized in C. elegans [5, 26, 27] (Figure 1A). The ASH neuron is also involved in mediating avoidance of high salt concentrations and the detergent sodium dodecyl sulfate (SDS) in the parasitic nematode S. stercoralis [20, 21]. Phylogeny of rhabditid nematode species used in our comparative analysis. (A) Neuronal connectivity of the polymodal ASH sensory neuron modified from [27, 41]. Red arrows indicate environmental stimuli perceived by the ASH neuron. The FLP and OLQ neurons play a minor role in mediating mechanosensory responses in Caenorhabditis elegans. Black lines indicate synaptic connections to the command interneurons that generate a backward movement in response to the stimulus. (B) Portion of the rhabditid phylogenetic tree adapted from Kiontke and Fitch  with species shown in red used in our analysis. Strain numbers are indicated in parentheses. The genus Caenorhabditis consists of different Caenorhabditis species including Caenorhabditis elegans and Caenorhabditis briggsae and the less closely related species Caenorhabditis sp. 3. Caenorhabditis tripartitum belongs to a different branch than the genus Caenorhabditis within the rhabditids. Pristionchus pacificus belongs to the diplogastrids and Panagrellus redivivus represents an outgroup to the entire group of rhabditids. 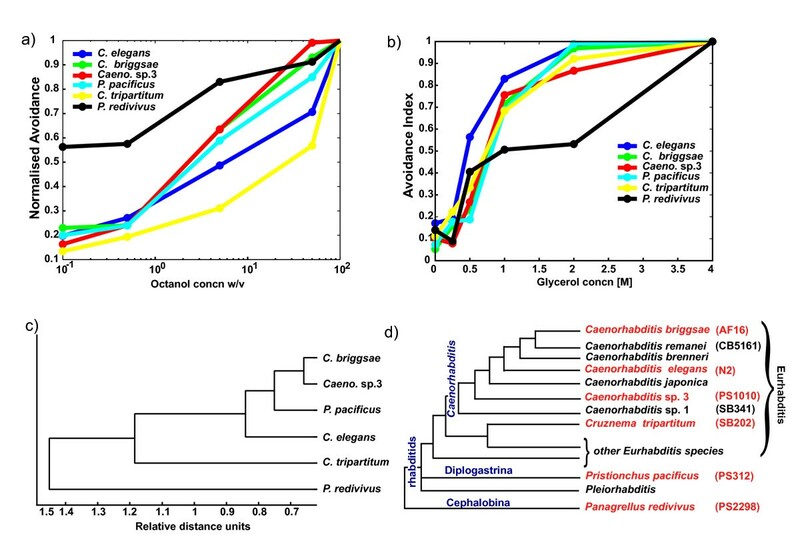 For our comparative analysis, we chose six representative free-living species from different groups of rhabditids with a range of phylogenetic distances to C. elegans (Figure 1B). Based on molecular data, rhabditids can be distinguished into two major clades: the Eurhabditis and the Pleiorhabditis . C. elegans, along with other members of the Caenorhabditis genus, belongs to the Eurhabditis clade . From the genus Caenorhabditis, we chose C. elegans (N2), Ceanorhabditis briggsae (AF16), and the less closely related Caenorhabditis sp. 3 (PS1010) [12, 13]. C. elegans and C. briggsae were isolated from compost and Caenorhabditis sp. 3 (PS1010) was isolated from galleries of palm and sugarcane weevils . Cruznema tripartitum (SB202) is also a member of Eurhabditis but belongs to a different branch than Caenorhabditis . This species has been isolated from different kinds of rotting organic material, and also from garden soil and compost . From the group of diplogastrids, we chose the satellite model system Pristionchus pacificus (PS312) [30, 31], which belongs to a genus that associates with beetles . Panagrellus redivivus (PS2298) was chosen as a representative of the outgroup and has been isolated from sugar-rich environments such as sap of rubber trees and brewery mash  (Figure 1B). The choice of nematode species provided a broad phylogenetic spectrum for our comparative analysis. Cellular anatomy is essentially invariant between individuals of the same nematode species and the number of neurons is highly conserved between nematode species, allowing the identification of neurons across different species of nematodes [6, 10, 17, 34, 35]. Using the neuronal map of C. elegans (Figure 2A) , we identified the amphid cell bodies in other species. The amphidial neurons are present posterior to the nerve ring in all the species. In C. elegans, the ASH neuron is part of a five neuron group (ASJ, AUA, AWC, ASH, and ASE) arranged in the shape of a 'V' (Figures 2A and 2B). The position of these neurons is more lateral than all other neurons in the same focal plane. An important feature of this arrangement is the presence of two neurons anterior to the AWC neuron, RMD and SIBD (Figures 2A and 2B). These two neurons along with the five neurons form a 'Y'. We found that this arrangement is conserved in all species examined (Figures 2C–E). We observed that in all species, the position and size of the putative ASH neuron was similar to C. elegans (Figures 2C–E). However, in C. tripartitum and P. redivivus, the putative ASH neurons are larger than those in C. elegans, consistent with the larger size of these species (Figures 2F and 2G). The RMD and SIBD neurons, which are small in C. elegans, are also larger in these species (Figures 2F and 2G). The dorsal triplet amphid neurons ASI, ADL, and ASK are found in a different focal plane and these cells were also found in the other species in the same position (Figure 2A). Identification of amphidial neurons in the different nematode species. (A) Neuronal map of the L1 larval stage the nematode Caenorhabditis elegans (reprinted from Sulston  with permission from Elsevier). The ASH neuron along with other neurons found in the same focal plane (red). The dorsal triplet amphidial neurons (green) are found in a different focal plane. The nerve ring, which surrounds the pharynx of the larva, is a process bundle with few or no cell bodies. (B-G) DIC light micrographs of the first larval stage (L1) in the different nematode species showing the amphidial cell bodies and nerve ring. B) C. elegans (N2), C) Caenorhabditis briggsae (AF16), D) Caenorhabditis sp. 3 (PS1010), E) Cruznema tripartitum (SB202), F) Pristionchus pacificus (PS312) and G) Panagrellus redivivus (PS2298). The ASH neuron (black arrowhead) is located laterally above the AUA neuron. All the neurons (ASE, ASH, AWC, AUA, ASJ) are present in the same focal plane. The SIBD and the RMD neurons posterior to the AWC neuron complete the 'Y' shaped arrangement. The nerve ring (nr) is shown (black arrow). In C. tripartitum and P. redivivus, the neurons are larger, correlating with the larger size of the nematodes. Scale bar = 50 μm. In C. elegans, amphid and phasmid neurons take up lipophilic dyes such as DiI, DiO, and DiD from the environment [36–38]. These dyes have been used to visualize the ASI, ADL, ASK, AWB, ASH, and ASJ amphid neurons, as well as the PHA and PHB phasmid neurons . We used DiI to visualize the amphid and phasmid neurons in all the species, and found that all species labeled most of the amphid neurons (Figures 3A–E). In addition, DiI staining showed that the morphology of the amphid neurons was very similar in most of the species as they label all parts of the neuron (Figures 3A–E). In C. elegans, all amphid neurons showed relatively strong dye uptake (Figure 3A). C. briggsae and Caenorhabditis sp. 3 also showed strong staining of all the amphid neurons (Figures 3B and 3C). In C. tripartitum, we could visualize only four of the six amphid neurons: ASI, ADL, ASK, and ASJ. We did not observe any staining of the ASH neuron in this species even though we were able to identify the neurons using differential interference contrast microscopy (Figures 3D and 2E). In P. pacificus, the ASH, ADL, and AWB neurons were stained relatively weakly compared with the other species (Figure 3E) and P. redivivus had the weakest staining for ASI, AWB, and ASJ neurons, respectively (Figure 3F). The differential dye uptake in the diverse species indicates that dye uptake is not sufficient to define equivalent neurons; however, it is consistent with general conserved properties of amphid neurons as having open sensory endings, and could have revealed major differences in morphology or position of neuronal cell bodies [7, 11]. Visualization of amphid neuron morphology in various nematodes using DiI staining. (A-E) Morphology of the different amphid neurons was similar in most species. In Caenorhabditis elegans, Caenorhabditis briggsae and Caenorhabditis sp. 3, all the amphid neurons were stained brightly. Cruznema tripartitum did not have any uptake in the ASH and AWB neurons and Pristionchus pacificus also exhibited a relatively weak staining in the ASH neuron and Panagrellus redivivus also had weak uptake in the ASJ and AWB neurons. For each species, the arrowheads indicate the neuronal cell bodies of the different amphids. The smaller arrows indicate the nerve ring as stained by the dye. The larger arrow depicts the dendritic processes that the neurons extend to the exterior. The small letters a and p represent the anterior and posterior regions of the nematode. Based upon standard assays, avoidance of the volatile odorant 1-octanol is remarkably conserved across all species tested (Figure 4). C. elegans responds quickly to 100% octanol (~2–3 seconds) [40, 41] Additonal File 1. 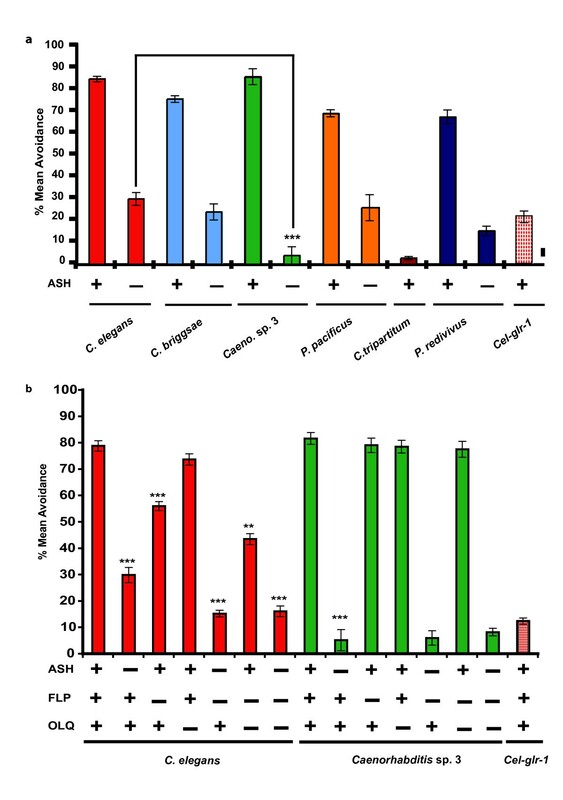 In C. elegans, in the presence of food, response to 100% octanol is primarily mediated by the ASH neuron, and in the absence of food ASH, ADL, and AWB neurons are responsible for sensing 100% octanol, suggesting that feeding status of the animal affects response to 1-octanol in C. elegans . All the species except P. redivivus responded after ~2–3 seconds of octanol exposure, indicating that these species are similar in sensitivity to C. elegans . P. redivivus showed significantly delayed sensitivity to 1-octanol, responding in an average of 5.9 seconds. The delayed response could be due to the requirement for a higher concentration of the chemical to generate a response. To confirm the identity of the putative ASH neuron identified by position and morphology (Figures 2B–G), we used a laser microbeam to kill the ASH neuron and assayed for octanol avoidance. Ablation of the ASH neuron in all the species is sufficient to abolish 1-octanol avoidance (Figure 4). As a control, we ablated the AWC neuron in all the species and found that ablation of this neuron did not result in loss of avoidance response to 1-octanol, suggesting that the ASH neuron is specifically required for avoidance to 1-octanol in all species (Figure S1 in Additional file 2). Octanol avoidance behavior is highly conserved in nematodes and is mediated by ASH neurons. Most species had similar avoidance times to Caenorhabditis elegans. Panagrellus redivivus showed significantly higher avoidance time to 100% octanol than Caenorhabditis elegans. ASH neuron ablations in different species resulted in animals not sensing 100% octanol. A mutant defective in the C. elegans vesicular glutamate transporter eat-4 was used as a negative control . Data are represented as mean avoidance time (in seconds) and error bars indicate standard error of mean (s.e.m). Mean avoidance time of different species was compared by ANOVA. Presence and absence of neurons is denoted by '+' and '-' respectively. P values are denoted as follows: ***, P < 0.0001. For unablated and ablated conditions, n = 30 and n = 15 animals, respectively. Nose touch avoidance behavior also showed a high degree of conservation among five of six species tested (Figure 5A). In C. tripartitum, after the first few positive trials, the animals failed to respond to nose touch, showing an overall avoidance of < 10%, suggesting that C. tripartitum adapts to the nose touch stimulus faster than C. elegans and the other species tested (Figure 5A). However, during the first three trials, C. tripartitum showed a quantitatively similar response to that of C. elegans (Figure S2 in Additional file 2). Ablation of the ASH neurons in five nose-touch responsive species resulted in loss of nose touch avoidance (Figure 5A). Four of five species showed nose touch responses in 20–30% of the trials (Figure 5A). However, in Caenorhabditis sp. 3, ASH-ablated animals completely lacked the ability to respond to nose touch (Figure 5A). Ablation of the AWC neuron did not affect response to nose touch in the different species (Figure S3 in Additional file 2). Nose touch avoidance behavior is primarily mediated by ASH neuron in different species of nematodes. Data are represented as mean percent avoidance and error bars indicate standard error of mean (s.e.m). (See Supplementary Materials and Methods in Additional file 1 for details). Presence and absence of neurons is denoted by '+' and '-', respectively. For unablated and ablated conditions, n = 30 and n = 10 animals, respectively. (A) Most species exhibit similar avoidance responses when challenged with a mechanosensory stimulus. Ablation of the ASH neurons results in reduction of nose touch avoidance in all species. In Caenorhabditis sp. 3 (PS1010), ASH ablation results in complete abolishment of nose touch response compared with ASH ablated animals in Caenorhabditis elegans. Mean percent avoidance of different species was compared using ANOVA. P values are denoted as follows: ***, P < 0.001. 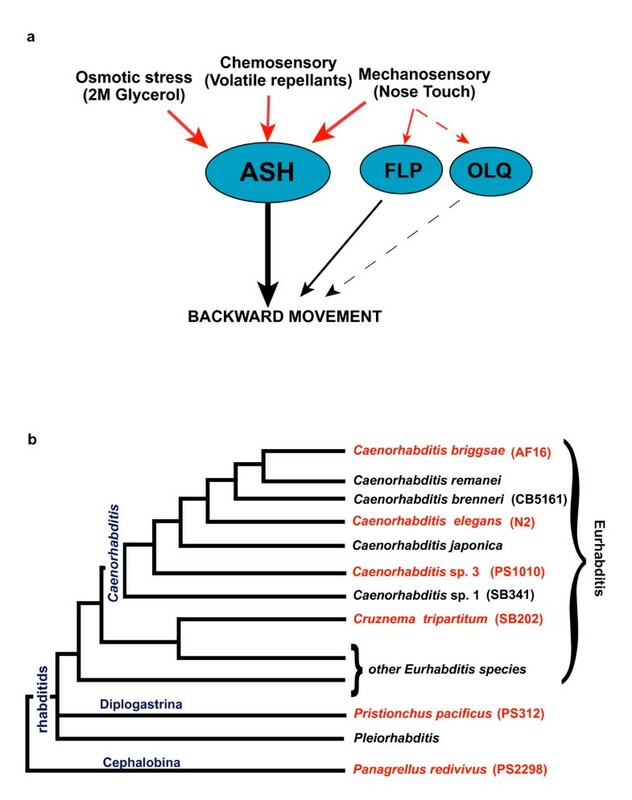 (B) FLP and OLQ neurons do not mediate nose touch response in Caenorhabditis sp. 3. In C. elegans, FLP-ablated animals were significantly different than unablated animals. ASH/FLP-ablated animals were significantly different than ASH-ablated animals. OLQ ablations did not affect nose touch in C. elegans. Ablation of FLP/OLQ had significantly lower nose touch response than either of the single ablated animals. Ablations of ASH/FLP/OLQ-ablated animals had significantly lower response than ASH-ablated animals but were similar in response to ASH/FLP-ablated animals in C. elegans. In Caenorhabditis sp. 3, FLP-ablated animals were not significantly different than unablated animals (P > 0.05). There were no significant differences in nose touch avoidance between ASH-ablated, FLP/ASH-ablated, and ASH/FLP/OLQ-ablated animals (P > 0.05). Other ablations tested for statistical significance: ASH-ablated vs. unablated animals, P < 0.001; FLP-ablated vs. ASH/FLP-ablated, P < 0.001; FLP-ablated vs. FLP/OLQ-ablated, P < 0.01; OLQ-ablated vs. FLP/OLQ-ablated, P < 0.001. P values were generated by ANOVA and denoted as follows: **, P < 0.01; ***, P < 0.001. In C. elegans, nose touch response is mediated by two non-amphid neurons, FLP and OLQ, in addition to the ASH neurons . To test whether nose touch response might be mediated by a single sensory neuron (ASH) and to check the role of the non-amphid neurons, we assayed nose touch response in FLP-ablated, OLQ-ablated, FLP/OLQ-ablated and FLP/OLQ/ASH-ablated animals in both C. elegans and Caenorhabditis sp. 3 (Figure 5B). In C. elegans, FLP-ablated animals were significantly less responsive to nose touch compared with unablated animals. OLQ-ablated C. elegans showed no effect on nose touch compared with unablated animals (Figure 5B). However, ablation of both the non-amphid neurons FLP and OLQ in C. elegans resulted in significantly decreased nose touch avoidance compared with either of the single neuron ablations, suggesting that among the non-amphid neurons, FLP plays a major role in mediating nose touch whereas OLQ plays a minor role  (Figure 5B). In C. elegans, FLP/ASH-ablated animals were significantly different from ASH-ablated animals (Figure 5B). Animals lacking FLP, ASH, and OLQ neurons were significantly different from ASH-ablated animals but not different from ASH/FLP-ablated animals (Figure 5B). In Caenorhabditis sp. 3, the FLP and OLQ neurons have no effect on nose touch response (Figure 5B). Moreover, ablation of both the two non-amphid neurons (FLP, OLQ) did not show any significant difference from either of the single ablated animals (Figure 5B). In Caenorhabditis sp. 3, ablation of all three neurons (ASH, FLP, and OLQ) did not significantly differ from ASH-ablated animals (Figure 5B). These results suggest that the ASH neuron completely mediates nose touch avoidance behavior in Caenorhabditis sp. 3, as compared with three neurons in C. elegans. It is conceivable that in Caenorhabditis sp. 3, other neurons could be involved in mediating nose touch behavior. However, ASH-ablated animals in Caenorhabditis sp. 3 show less of a nose touch response compared with ASH/FLP/OLQ-ablated animals in C. elegans, suggesting that ASH mediates most of the nose touch response in Caenorhabditis sp. 3 (Figure 5B). The sensory response network for mechanical stimuli in Caenorhabditis sp. 3 thus shows a reduction in the number of neurons involved compared with C. elegans. Osmotic avoidance behavior was assayed using the standard drop assay  (Figure 6A). C. elegans responds within a second of drop delivery by backing away from the drop of osmotic solution . The avoidance index (a.i.) was calculated by dividing the number of positive responses to the total number of trials  (Additional file 1). Within the Caenorhabditis clade, all three species tested responded similarly to C. elegans with respect to response times to 2 M glycerol. However, the phylogenetically distant species, P. pacificus, C. tripartitum, and P. redivivus, had longer response times compared with C. elegans (Table 1). The average response times for P. pacificus, C. tripartitum, and P. redivivus were 5.2, 7.4, and 8.1 seconds, respectively (Table 1). P. redivivus, the most distant species tested, showed significantly decreased sensitivity to 2 M glycerol compared with the other species (Figure 6A). We speculate that P. redivivus could be adapted to high osmotic conditions because it was initially isolated from high sugar concentration environments. Osmotic avoidance behavior evolves at the cellular level in different nematodes. Data are represented as mean avoidance index (see Supplementary Materials and Methods in Additional file 1 for details) and error bars indicate standard error of mean (s.e.m). Presence and absence of neurons is denoted by '+' and '-', respectively. Ablated animals were tested with 2 M glycerol. For unablated and ablated conditions, n = 30 and n = 10 animals, respectively. (A) Most species showed similar responses to osmotic avoidance to Caenorhabditis elegans. Panagrellus redivivus (PS2298) showed significantly low sensitivity to both 1 M and 2 M glycerol concentrations compared with C. elegans. In all species tested, ablation of the ASH neuron resulted in failure of animals to avoid osmotic stress. Ablation of ASH neurons in P. redivivus resulted in animals not responding to the 2 M glycerol. ASH-ablated C. elegans significantly differ from ASH-ablated Pristionchus pacificus. P values were generated by ANOVA for the different species and are denoted as follows: *, P < 0.05; ***, P < 0.0001. (B) Cellular additivity of osmotic avoidance behaviors in P. pacificus. Ablation of ADL neuron had no effect on osmotic avoidance in C. elegans. ADL-ablated animals in P. pacificus had a significantly lower avoidance index than unablated animals. Ablation of ASH and ADL neurons in P. pacificus resulted in complete loss of osmotic avoidance. P values were generated using ANOVA. P values are denoted as follows: *, P < 0.05; **, P < 0.01; ***, P < 0.001. In Caenorhabditis elegans, the animal backs away from the stimulus almost instantaneously within a second. However, avoidance to high osmolarity conditions by more distant species varies. Panagrellus redivivus was the slowest in response time in our assay. Data represented here is the average response time of 40 animals per species tested over multiple days. Ablation of the ASH neuron almost completely abolishes osmotic avoidance response in C. elegans . 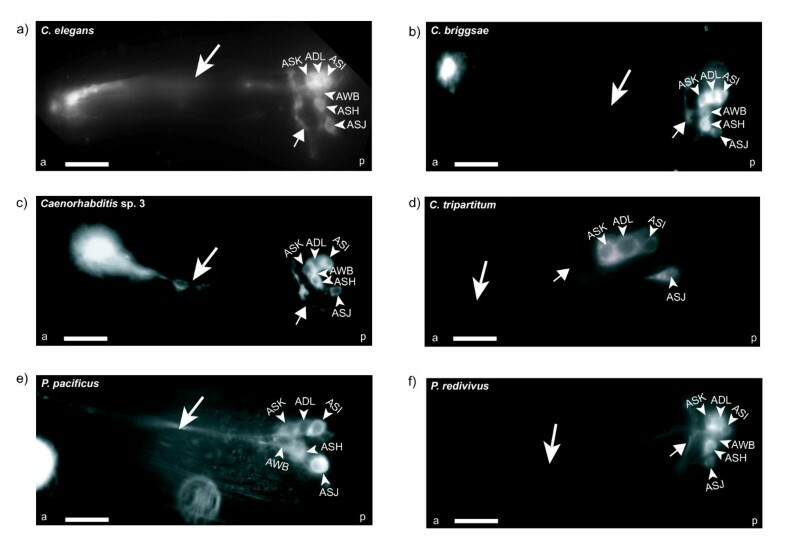 In the parasitic nematode S. stercoralis, avoidance response to high salt concentrations is completely mediated by the ASH neuron . Ablation of the ASH neuron in the other species resulted in reduced a.i. (Figure 6A). ASH ablation does not completely abolish osmotic avoidance in P. pacificus, suggesting the possibility of ASH-independent mechanisms of osmotic avoidance (C. elegans a.i. = 0.15 vs. P. pacificus a.i. = 0.36; Figure 6A). In C. elegans, ASH, ADL, ASK, and ASE neurons are known to mediate avoidance of chemical repellents . The residual osmotic avoidance seen in ASH ablated animals of P. pacificus could be mediated by these neurons. In C. elegans, ablation of the ADL neuron had no effect on osmotic avoidance (Figure 6B). Ablation of both ASH and ADL neurons in C. elegans did not show a significant change in osmotic avoidance index compared with ASH-ablated animals (Figure 6B). In P. pacificus, ablation of ADL neuron results in a significantly lower avoidance index compared with unablated animals (Figure 6B). Ablation of both ASH and ADL neurons in P. pacificus had a significantly lower avoidance index compared with ASH-ablated or ADL-ablated animals, suggesting an additive effect of both the neurons in osmotic avoidance behavior (ASH/ADL-ablated a.i. = 0.17 vs. ASH-ablated a.i. = 0.36; ASH/ADL-ablated a.i. = 0.17 vs. ADL-ablated a.i. = 0.62) (Figure 6B). Ablation of the ASK and ASE neurons did not change the osmotic sensitivity of P. pacificus, indicating that these neurons do not play any role in osmotic avoidance (data not shown). Hence, we believe that the ASH neuron is the primary sensory neuron for mediating osmotic avoidance in all nematode species, but additional sensory neurons, such as ADL neuron in P. pacificus, may contribute to mediating osmotic avoidance. In C. elegans, the ADL neuron, along with ASH and ASE neurons, mediates avoidance response to heavy metal ions, but does not play a role on its own in mediating this avoidance . In the dog hookworm A. caninum, both ASH and ADL neurons are required to mediate avoidance of the detergent sodium dodecyl sulphate . Ablation of only the ADL neurons in the hookworm results in an assortment of responses, from avoidance to non-responsive behavior, suggesting that the animal is not able to decide whether to respond to the chemical . In P. pacificus, ablation of ADL neuron resulted in a significant reduction of avoidance response, indicating that this neuron is necessary for mediating avoidance to high osmotic conditions. The role of the ADL neuron during avoidance behaviors in different species thus remains unclear. Perhaps analysis of the genes expressed in the ADL neuron would provide insight into the role of this neuron in the different species. We cannot rule out the possibility that ablation of specific neurons results in functional replacements by other neurons. However, if this occurs, then this aspect of nematode neurobiology varies among cells, behaviors, and species. We hypothesized that nematodes would display habitat-specific sensitivity to the same stimuli rather than phylogeny based sensitivity. Therefore, we tested several different concentrations of the different noxious stimuli (chemosensation and osmosensation), and used a cluster algorithm to generate a behavioral dendrogram for the different avoidance behaviors (see Methods). For octanol avoidance, we tested concentrations ranging from 0.1% to 100% octanol. The data for the different species was then normalized for each concentration with the maximal value for that concentration giving a normalized avoidance index for the different species (see Methods). P. redivivus displayed the least sensitivity to octanol compared with the other species at the different concentrations (Figure 7A). C. elegans and C. tripartitum show similar sensitivity to 1-octanol (Figure 7A). Also, in C. briggsae, Caenorhabditis sp. 3, and P. pacificus, sensitivity to octanol avoidance was more similar to each others' than to the other species' (Figure 7A). Sensory sensitivity to different concentrations of the stimuli varies in the different nematode species. (A) Concentration curves for octanol avoidance. We tested concentrations ranging from 0% octanol to 100% octanol on the species and found that Panagrellus redivivus did not avoid this noxious chemical to the same extent as the other species. Caenorhabditis elegans and Cruznema tripartitum displayed similar trends in avoidance and Caenorhabditis briggsae, Caenorhabditis sp. 3 and Pristionchus pacificus responded very similarly. Data for each species is represented as normalized avoidance index (see Methods for details). (B) Concentration curves for glycerol avoidance. Concentrations ranging from 0.1 M to 4 M glycerol were tested on the different nematodes. We found that P. redivivus showed least avoidance of glycerol at concentrations wherein the other species fully responded to glycerol. At the highest concentration tested, P. redivivus also responded strongly to glycerol. All the other species displayed similar avoidance of different concentrations of glycerol. Data for each species is represented as normalized avoidance index (See Methods for details). (C) Behavioral dendrogram for osmotic avoidance and octanol avoidance and its relation to the phylogenetic tree. The dendrogram was generated using hierarchical clustering for these two sensory behaviors. This data set incorporated all the different ablations done in the different species for the different behavioral assays. As expected P. redivivus and C. tripartitum exhibited the most different behavioral repertoire compared with the other species. (D) Phylogenetic tree of the species used in our analysis. As with osmotic avoidance behavior, we found that P. redivivus was the least sensitive to glycerol compared with the other species (Figure 7B). This observation correlates with the fact that P. redivivus has been isolated from high osmotic strength environments and hence could be adapted to high osmolarity [33, 44]. However, at the highest concentration tested (4 M glycerol), P. redivivus also exhibited a very high avoidance, as did the other species (Figure 7B). C. briggsae, Caenorhabditis sp. 3, C. tripartitum, and P. pacificus exhibited similar sensitivity to osmotic avoidance (Figure 7B). 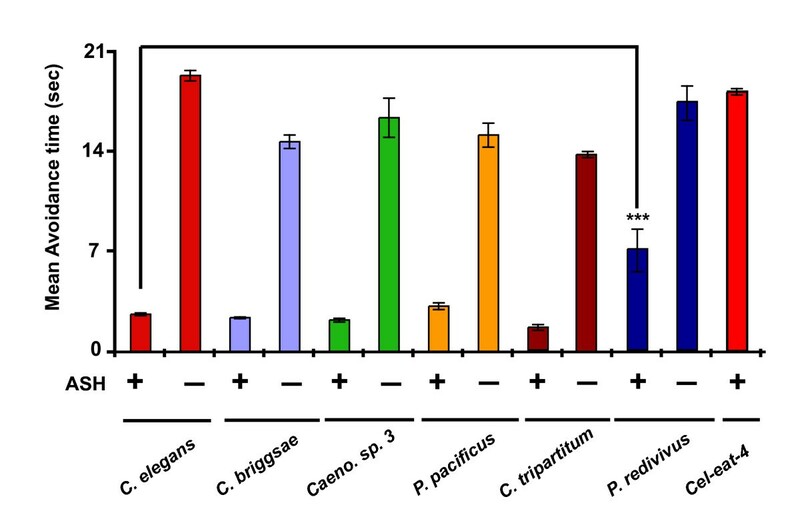 C. elegans exhibited slightly different osmotic sensitivity different from all these species with the exception of P. redivivus (Figure 7B). Hence, other than P. redivivus, all other species exhibited similar sensitivity to different osmolarity conditions. Finally, we combined the data of octanol and osmotic avoidance behaviors including the ASH neuron ablation data for all the species and found that P. redivivus exhibited the most different behavior in our analyses (Figure 7C). Based on relative distances computed by the algorithm, C. tripartitum is the next closely related species to P. redivivus. C. elegans, along with the other species, forms a whole branch on the behavioral dendrogram, with P. pacificus being closely related to it. C. briggsae and Caenorhabditis sp. 3 form a sub-branch, suggesting that these two exhibit similar behaviors. Comparing our behavioral dendrogram for octanol and osmotic avoidance behaviors with the phylogenetic tree, we see some interesting features (Figures 7C and 7D). We observe that for these two behaviors, the relative positions of P. redivivus and C. tripartitum resemble that of the phylogenetic tree (Figures 7C and 7D). P. pacificus seems to be behaviorally similar to the branch of Caenorhabditis sp. 3 and C. briggsae. Given the association of Caenorhabditis sp. 3 with rice weevils  and P. pacificus with beetles , this correlation makes sense. Unexpectedly, C. elegans does not exhibit similar behavioral properties like its close siblings C. briggsae and Caenorhabditis sp. 3. These data suggest that sensitivity to different stimuli varies among species and that the differential sensitivity could be linked to the functional sensory receptor repertoire of these species . By comparing multiple aversive behaviors in many nematode species at a cellular level, we demonstrate the relative flexibility of the sensory system of nematodes. This suggests that the sensory architecture mediating certain polymodal behaviors can evolve (Table 2). We observed that all species tested in our analysis avoided the three different aversive stimuli with the exception of the nematode C. tripartitum, which showed a high degree of adaptation to nose touch. Similarly, parasitic nematodes also avoided several aversive stimuli [14, 18, 34, 47]. Such conservation of avoidance behaviors in the different nematode species suggests that natural selection maintains these behaviors [48, 49]. Most species respond similarly to the volatile odorant 1-octanol. This response is completely mediated by the ASH neuron. However, nose touch and osmotic avoidance responses evolve: in Caenorhabditis elegans, three neurons mediate nose touch whereas in Caenorhabditis sp. 3, only ASH mediates this response. Avoidance to high osmolarity conditions is primarily mediated by the ASH neuron, but in Pristionchus pacificus, the ADL neuron also contributes to this sensory response. '+' denotes the degree of involvement of the neuron in mediating the behavior; '+++', completely mediates; '++', partially mediates; '+', weakly mediates; '(+)', mediates but only observable when other neurons are ablated; '-', not involved; ND, not tested. At a cellular level, avoidance response to the chemical 1-octanol was mediated by the ASH neuron in all species. In parasitic nematodes, avoidance of high salt concentration and sodium dodecylsulfate is also mediated by the ASH neuron [20, 21]. However, for nose touch response behavior, we observed a reduction in the number of sensory neurons relative to C. elegans, with only the ASH neuron mediating this response in Caenorhabditis sp. 3 as compared with three neurons in C. elegans (ASH, FLP, and OLQ). On the other hand, we see an increase in the set of sensory neurons mediating osmotic stress with the ADL neuron partially mediating osmotic avoidance in P. pacificus along with the ASH neuron (Table 2). We also observed that sensory sensitivity to certain stimuli varied between the different species tested. These differential responses could be attributed to adaptation of the species to their respective niches. For example, P. redivivus has a slower response time in response to 1-octanol and is highly resistant to high osmotic conditions (Figures 4 and 6). Since P. redivivus was isolated from the sap of rubber trees and brewery mash, these responses could be attributed to adaptation to sugar-rich environments. The conservation of several properties of a multi-functional neuron across diverse lifestyles is not surprising, given the constancy of neuron number in these nematodes. However, to understand how sensory responses evolve, comparison of closely related species is an essential prerequisite. Such studies can uncover selection pressures that act within a shared evolutionary history to cause either differences in their behavior or changes in cellular contribution to these behaviors . These changes may evolve by alterations in the number and type of sensory receptors each neuron expresses, by the efficacy of signal transduction in sensory neurons, or by the strength of connectivity of the neuron to its postsynaptic partners. Our results provide a clear demonstration of change in the relative contributions of nociceptive neurons in a sensory network in diverse free-living nematode species. 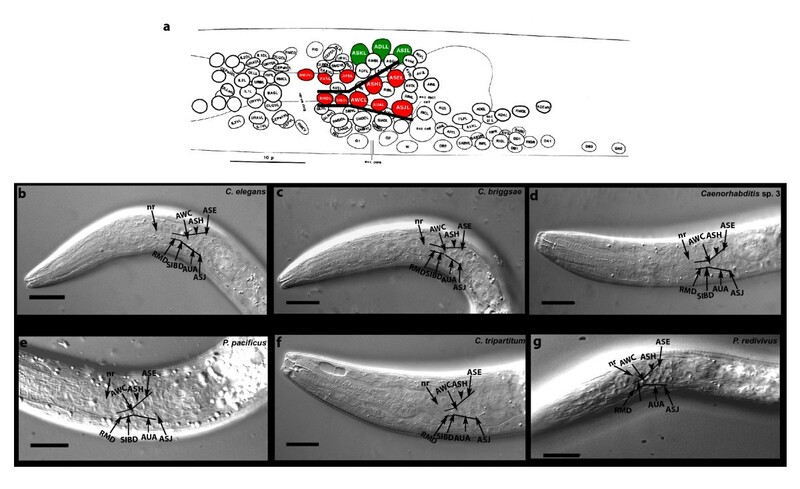 These studies allow inference of ways in which sensory responses in free-living nematodes might evolve, and suggest how such evolution might occur in medically and agriculturally relevant nematodes. All strains were raised at 20°C unless indicated otherwise, using standard methods . 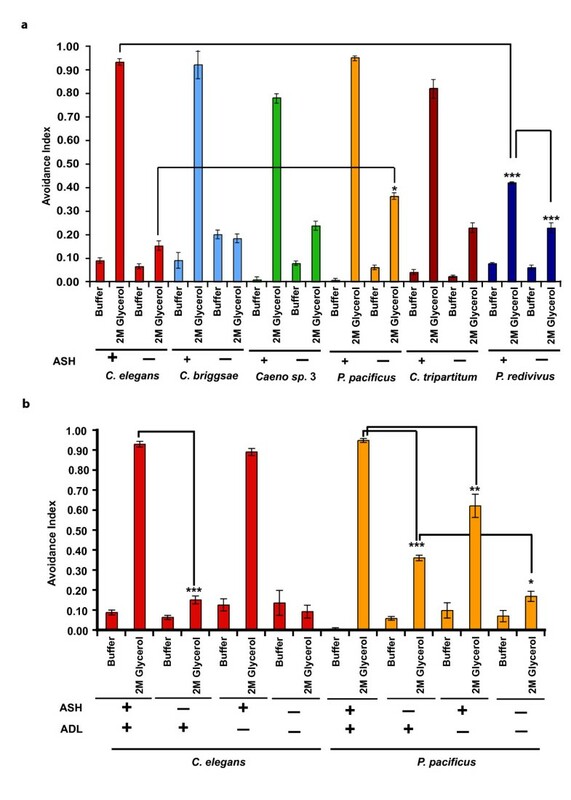 Strains used in this study were C. elegans (N2 Bristol isolate) , C. elegans eat-4(ky5) MT6308 , C. elegans glr-1(n2461) KP4 , C. briggsae (AF16), Caenorhabditis sp. 3 (PS1010), P. pacificus (PS312) , C. tripartitum (SB202), and P. redivivus (PS2298/MT8872) . A stock solution of DiI (2 mg/ml) was prepared in dimethyl formamide and stored at -20°C . Worms from the different species were washed from plates and resuspended in a small eppendorf tube to a 100 μl volume. The worm pellet was washed thrice in M9 buffer and worms allowed to settle down using gravity. To this pellet we added a 1:200 dilution of DiI solution and incubated in the dark for 2–3 hours. After the incubation, the worms were washed three times in M9 buffer and then mounted on a slide to visualize the amphid neurons. For some species, we used a longer incubation time (5–7 hours) to visualize neurons. For all species tested, we used the L1 larva stage for our ablations as described previously . All behavioral assays were performed as described previously [23, 25, 42]. A detailed description of the ablations and behavioral assays is given in the Supplementary Materials and Methods in Additional file 1. Ablation of one of the two bilaterally symmetrical neurons did not affect the avoidance response to different stimuli. For octanol avoidance sensitivity, we made different dilutions of 100% octanol (0.1%–100%) and each species was tested with each concentration at least on three different days. Data was represented as average avoidance time for each concentration. Similarly, for sensitivity to osmotic avoidance, we tested concentrations ranging from 0.1 M to 4 M glycerol. Data was represented as mean a.i. (see Supplementary Materials and Methods in Additional file 1 for details). For each of the behavioral assays, the normalized a.i. was computed for each species. This was done by normalizing the value for each species at each concentration to the maximum value for that concentration. The normalized values for the different concentrations were then plotted for each species in Matlab. For obtaining the dendrogram, data was then clustered using a Matlab hierarchical clustering algorithm (Euclidean distances and average linkage). The x-axis of the dendrogram indicates relative distance between the different species. The statistical tests employed are described in Additional file 1. We thank the Bargmann Lab and the Hart Lab for advice, and Krisha Begalla and Dorota Korta for help with the behavioral assays, Alon Zaslaver for suggesting the cluster analysis and help in generating Figure 7. We thank Karin Kiontke for the C. tripartitum (SB202) strain and advice on phylogeny. Some nematode strains were provided by the Caenorhabditis Genetics Center. We also thank Cori Bargmann, Ryan Baugh, Takao Inoue, Elissa Hallem, Marie-Anne Felix, Ralf J. Sommer and Karin Kiontke for discussions and comments on the manuscript. JS is an Associate and PWS is an Investigator of the Howard Hughes Medical Institute, which supported this research. OD was supported in part by a Summer Undergraduate Fellowship from Caltech. JS and PWS designed the experiments, JS and OD performed the experiments, and JS wrote the paper with input from PWS.